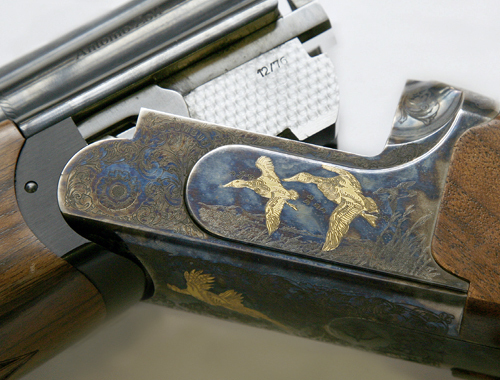 Formed into the company we see today immediately after World War Two, in recent years Zoli has embarked on what it calls its ‘Classic Revolution’ – essentially designing guns to the highest standards and tolerances technology allows while retaining the classical look of a shotgun. Like most modern gunmakers, this means the vast majority of the work in manufacturing the guns is left to computer-controlled machines, with gunsmiths using much of their time to finish the guns. So far then, Zoli’s story is a familiar one. However, a key difference comes in the workings of the gun. Unlike many manufacturers that choose to rely upon tried-and-tested actions – such as those by Anson and Deeley or Webley – and apply their own aesthetic stamp outside, Zoli chose to research, design and manufacture a lock mechanism entirely of its own. 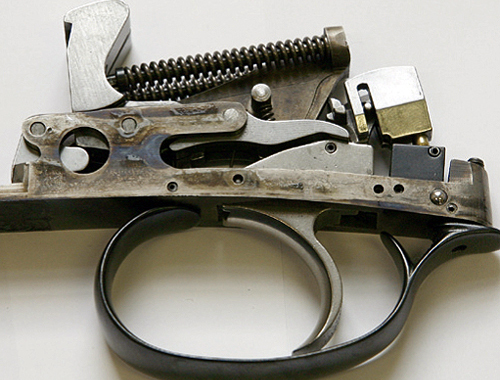 All the working internal parts of the gun save the firing pins and safety mechanism are mounted onto a slim trigger plate, which can easily be removed using a supplied wrench. Given how extensively this design has been engineered, any concerns you may have about buying a gun from this slightly less well-known maker should be put to one side. Moreover, these guns are being imported by Edgar Brothers, who offer a superb five-year guarantee on all their products. The gun is supplied in a large, sturdy, hard case – as you would hope – and is available in a range of barrel lengths with fixed or interchangeable chokes. It is available in a coin finish or, like our test gun, with colour hardening – an impressive effect that certainly draws the eye. First impressions are largely positive. 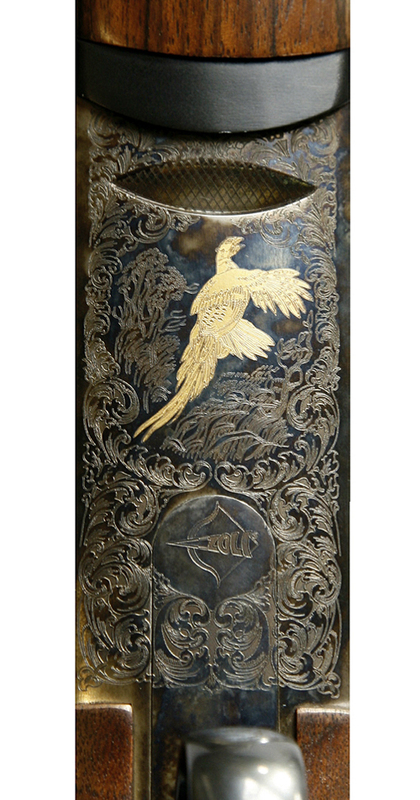 The engraving is of a good standard, with game scenes on each side and on the bottom of the action featuring gold inlaid duck, partridge and pheasants. There is attractive foliate engraving elsewhere. Though not especially deep, it is nevertheless quite appealing. Closer inspection reveals the gun to be slightly wider in the action than most over-unders thanks to the removable lockwork. This is mitigated somewhat by allowing for a shallower action body and attractive carved fences. The woodwork is a little disappointing, with our test gun being plain and looking a little under-oiled; any good gunsmith could probably improve this significantly. The checkering is a little coarse and though the wood to metal fit is good, the operation of the Zoli can feel a little unrefined and oddly unsatisfying – particularly when opening and closing the gun. The steel trigger is rather unsophisticated and quite broad, which may not suit those who prefer a more precise trigger pull. The fore-end was very difficult to remove, requiring a fairly significant tug. This makes what should be a simple operation slightly worrisome and is not particularly reassuring. The grip on the stock, in contrast, is a real highlight, having a squared-off Prince of Wales-style pistol grip that is swept back. This hybrid of a straight-hand and squared pistol grip is very comfortable and feels sure in the hand – it really does make the gun a pleasure to shoot. It is a fine shotgun, which shoots very well, and will doubtless be reliable in the way that virtually all modern guns are. However, inevitably in a crowded market place, where this gun may struggle is on price and at £4,200 it represents a significant investment. The Zoli undoubtedly brings a fresh approach and will give you something to talk about on shoot day, and it is a reassuringly good performer. But at £4,200 it’s in a very competitive market up against the likes of Caesar Guerini, as well as established favourites Beretta and Browning. Any initial fears about the gun being slightly barrel-heavy are waylaid as soon as the gun is mounted, which it allows you to do in fine style. Once up the gun swings well and is surprisingly instinctive to shoot. Its superb grip comes into its own, with the longer sweep coupled with a semi-pistol grip making the gun feel fantastic in the hand. Muzzle flip is dealt with well, and though it might benefit from the addition of a rubber recoil absorbing pad on a long day’s shooting, recoil is kept to a minimum too. 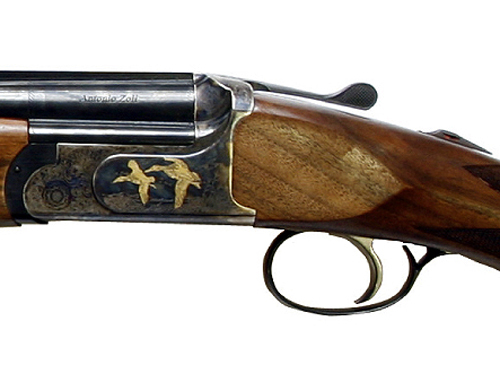 The gun copes well with very heavy loads, so this Zoli would certainly do a good job on high driven birds. Bill Elderkin casts his expert eye over the Zoli Columbus The design of this gun, with its trigger-plate action, is good from a security point of view, but in day-today use you will not need to worry about it. In fact, I would recommend leaving it well alone as it is a pretty complex bit of engineering and really shouldn’t require any more cleaning than your gunsmith will carry out at your end-of-season check-up. Though it is an intricate mechanism, it is a strong one. Although the instruction booklet says the gun is not Magnum proof, the stamps on the barrels state otherwise. I think something may have been lost in translation here; the instruction book also suggests you should wear eye protection when assembling the gun out of its case! Though the Zoli looks bulky, it is in fact somewhat lighter than you would expect, weighing in at 6lbs 14oz. The triggerplate action makes altering the stock for more extreme cast and bend measurements quite difficult. Therefore you should bear this in mind before you pick one up if you have unusual demands for your stock dimensions. Though these guns offer something a little bit different from the usual suspects, such as Beretta, Browning and Miroku, I would worry about the potential resale value, as this maker has never made much of an impact on the British market up till now. 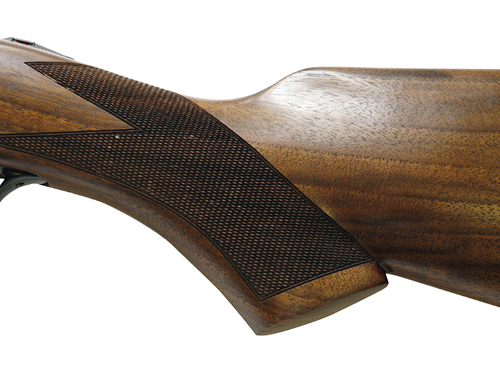 This Zoli has an RRP of £4,200 and at this price you are spoilt for choice for over-unders for your game shooting. While you won’t get a new Perazzi for this price, a second hand one would be a rival and I would certainly consider Caesar Guerini to be a good contender in this bracket. Beyond these two names it’s hard to look further than the market leaders, albeit in a slightly more affordable bracket. 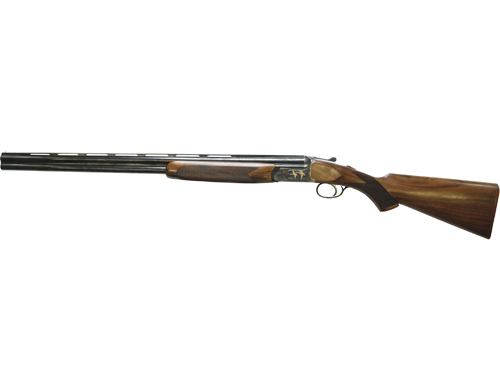 Firstly, I would look at a Beretta Silver Pigeon I or an SV10 Prevail at £1,550 or £2,050 respectively. Both are superb guns and made by one of the world’s finest gunmakers. The Silver Pigeon is probably the gun most people think of when looking for a reliable, value for money over-under. And its action is supremely reliable. Both Berettas handle and shoot beautifully, and they aren’t bad to look at, either. They are available with 26″, 28″, 30″ or 32″ barrels, with fixed or multichokes. They are undoubtedly two of the best performing and best value over-under guns on the market. You’ll also get plenty of after-sales support as importer GMK is one of the most successful around. Browning offers its Classic and Elite 525 models, which are among the best-looking over-unders you can buy. They shoot superbly too, costing £1,550 and £2,500 respectively. Guns for sale? Buy or sell your gun here!